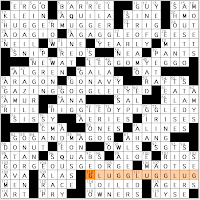 Ashish Vengsarkar and Narayan Venkatasubramanyan's New York Times crossword, "Literally So"
23A. [-IRC-MS-ANCES] is the clue for OUT OF CONTEXT. The missing letters in CIRCUMSTANCES spell CUT, and if you CUT something out of its circumstances, you take it OUT OF CONTEXT. That's a little awkward, because circumstances and context don't feel quite synonymous enough to me. 36A. [ANTI--VERNMENT UN--ST] is ANTIGOVERNMENT UNREST without GORE, and we're not talking about Al Gore—we're talking about a BLOODLESS REVOLUTION. 52A. [AR--CL-] is ARTICLE without TIE, cluing THE MISSING LINK. Oh! I get it now. The word "the" is a definite article, grammatically speaking, and it's missing a tie, and a tie is a link, which gives us a THE that's MISSING a LINK. 70A. [P---ARY CARE PHY-ICIANS] are PRIMARY CARE PHYSICIANS without RIMS, or the well-known NGO called DOCTORS WITHOUT BORDERS. This is my favorite of the theme entries. 86A. A SPARE tire with NO EXPENSE is a [FI-TH WH--L] with no FEE. 121A. First, let me say that I don't care for lemon desserts. There's such a thing as LEMON DROP COOKIES? I didn't know. The clue is [W--THL-SS R-AD-TER], which expands to WORTHLESS ROADSTER without OREOS, a LEMON that has DROPped its COOKIES. This one is a little clunky even if you like lemon cookies because "worthless roadster" is not remotely an established phrase, jalopyjournal.com's usage notwithstanding. So, the theme can be described as (mostly) familiar phrases from which a word has been excised, and the concept of that X-less Y then clues the theme answer you write in the boxes. Does that sound about right? I didn't love every part of the theme, but I appreciated the mental exertion required to wrap my head around each theme entry. I also like the way the theme answers wield seven different ways of phrasing the concept of omission: OUT OF, -LESS, MISSING, WITHOUT, NO, LEAVES, and DROPS. 107A. [Hawaiian massage] is LOMILOMI, which I've never heard of. I just read a little about it, so...now I've heard of LOMILOMI. 84A. EAGAN is clued not as the non-Edina Minneapolis suburb (which would've been a gimme) but as [1991 Tony winner Daisy]. Broadway's not in my wheelhouse, as many of you know. 29A. DIES IRAE was gettable as an 8-letter hymn name, but the OLAFy clue, [Hymn whose second line is "Solvet saeclum in favilla"], didn't help one whit. I believe, based on painfully little knowledge of Latin, that this translates to "I solved it in seclusion in my favilla, whatever that is." I may well be wrong. 5D. Yes, this is incredibly basic, but I was thinking that [Us] was cluing one longer word rather than three little ones, YOU AND ME. 8D: [Alternative to satellite] radio is AM/FM. 36D. BONITO is a [Mackerellike fish], and I gotta say, "mackerellike" is one ungainly adjective. 92D. ALEATORY is a high-end vocabulary word. It's clued as [Dependent on chance], and I got it without having all the crossings in place but I'm not sure how. I just had an ALEATORY feeling. 66D. Oddball trivia! Who knew that THOM MCAN is the [Shoe brand reputedly named after a Scottish golfer]? 61A. ROOTS are a tree's [Underground network]. SEWER is also 5 letters, as is MAFIA. Traps galore! [Bygone flier] pulls double duty as SST (30D) and TWA (64D). I kinda wanted SST the second time but knew that wouldn't fly. 76A. [Currency union since 1999] is called the EURO AREA? I'm not familiar with that term. There are a couple cute wordplay clues. 34D: AVIS is clued as a [Company name that becomes another company name if you move its first letter to the end], Visa. This is the Unkind Donuts trick in reverse, of course. It's hard to come up with a clue for 103D: ARLO that is entertaining, but this one is [Man's name that's an anagram of 108-Down], which is the ORAL [Exam format]. This was a pretty tough Sunday puzzle, wasn't it? At this writing, one person in the NYT applet standings trounced me by two minutes (hi, Barry! ), so I figure there'll be others who claim it wasn't so hard at all. But I know the truth. Dan Naddor's syndicated Los Angeles Times crossword, "Organ Transplants"
This puzzle has a theme similar to another one I recently did; that one had a "transfer" theme that was fresh in my head so I knew how the theme was going to work once I had FELT CONDOLENCES filled in (24A: [Pool hall "Better luck next time"?]). An assortment of body parts are resected from one phrase and transplanted into another, with the phrases clued to reflect their changed wording. Organ donor theme entries 1, 2, 3, and 4 partner with organ recipients 8, 7, 6, and 5, their symmetrical partners. FELT CONDOLENCES (24A) lost its opening HEART, which moved to the middle of jailbreaks to make JAIL HEARTBREAKS in the opposite spot in the grid (102A: [Sorrows behind bars?]). The EAR leaves ear-SPLITTING NOISE (30A: [Sound of a breakup?]) and is transplanted into DOG-EAR TRAINING (91A: [Place-marking lessons for readers?]). The OSU Buckeyes become some money, OHIO STATE BUCKS (43A: [Columbus college funds?]). The EYE moves into FORTY EYELASHES (80A: [Minimum for a Maybelline ad shoot?]). I was feeling more punitive and started with FIFTY eyeLASHES. STORMING SESSION (52A: [Temper tantrum?]) drops its initial BRAIN, which relocates inside a grandchild to become GRAND BRAINCHILD (73A: [Steinway's idea for a large piano?]). The original with- and without-organ phrases the theme entries are based on are all very much in-the-language entities. A Google search suggests that both 40 and 50 lashes are common counts (and that too many countries still use this barbaric punishment). FELT CONDOLENCES is perhaps the weakest of the eight theme answers, because we don't much refer to pool halls with a metonymic "felt," I don't think. But everything else is so smooth I'm willing to take one B- answer amid the solid A's. 16D. The PANIC BUTTON? [It's pressed in distress]. 69D, 75D. MILITIAMAN, or [Revolutionary soldier], rests beside HELEN HUNT, the ["Twister" actress]. 61D. CHINA SEAS looks weird, right? It's clued as a [Segment of the western Pacific]. It is probably a better entry than the singular CHINA SEA, which does not exist but was in another puzzle not long ago. The CHINA SEAS consist of the South China Sea, East China Sea (nope, no North or West), and Yellow Sea. 62D. I don't like POTATO SALAD, but you are welcome to have it as a [Picnic side] if you want to. Knock yourself out. 27D. ATROCIOUS means [Just plain awful]. In seventh grade, I told a classmate that she had "atrocious grammatical errors." She replied, "You are one, too." Amazing, isn't it, that I didn't get beat up? 12A. [Concert dancing areas] are MOSH PITS, sometimes. 107A. An IRS AUDIT is a [Taxpayer's headache]. I've never been audited, but last year the IRS came after us for some stock options that hadn't been included on our return. Luckily, the taxes had been taken off the top, so we ended up writing checks for $3 and $4 to the IRS and the state. It was a rather stressful $7, though. 21A. HUGGER-MUGGER is an old word meaning [Every which way]. 26A. A GAGGLE OF GEESE are often a [Honking assemblage]. 42A. The waffle ad catchphrase "LEGGO MY EGGO" is clued as [Words said while fighting over food]. 57A. [Being amazed, in a way] clues GAZING GOGGLE-EYED. Meh: While you can indeed gaze in a goggle-eyed fashion, I wouldn't say that the phrase is a discrete unit of meaning. 68A. HIGGLEDY PIGGLEDY means [In disorder]. This pairs nicely with its fellow rhyme at 21A. 82A. [Symbolic Bible nations] are GOG AND MAGOG. 103A. A famous [1950s wrestler] was called GORGEOUS GEORGE. 110A. GLUG, GLUG, GLUG is clued as [Guzzling sounds]. That reminds me: I received a note yesterday from a reader who was drinking bourbon and asked me to mention that 69D, LEO G. ([Actor Carroll]) should not appear under 5A, a BARREL ([Crude container]), because anyone who's seen 1955's Tarantula knows that the line is "I knew Leo G. Carroll was over a barrel when Tarantula took to the hills." 3D. Like 57A, GIGGLING GIRLS doesn't feel like an in-the-language phrase to me. The clue is [Tee-hee sources]. 54D. Ditto for FEELING GROGGY. "Feeling Groovy" has Simon and Garfunkel cred, but FEELING GROGGY is just verb + adjective. 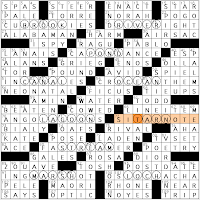 Good clue for it, though: [Suffering from a long fight or a long flight, perhaps]. 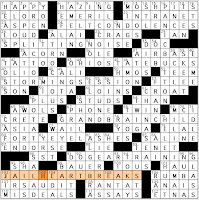 Toughest word in the fill: 56D: STADES, or [Straight tracks for footraces]. I like AQUILA, the 18A: [Constellation that means "eagle"]; someone with an aquiline nose has a beak that's curved or hooked like an eagle's beak. All right, how many of you found 11D: [Savonarola's first name] to be a gimme? I think I've seen this one before, but I still needed an awful lot of crossings to get to GIROLAMO. Various baby name websites tell me it means "sacred name" and is essentially the same as Jerome and Hieronymus. 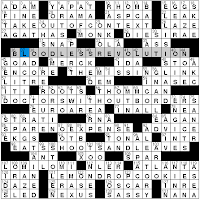 Emily Cox and Henry Rathvon's Boston Globe crossword, "All Wet"
Anyone know if the Across Lite Globe puzzle has caught up to the Sunday paper? Bostonians, is this puzzle over a month old, or is it this weekend's? The theme is embedded bodies of water (which I've spotlighted with circled squares) split among the words in various concocted phrases. BROOK sits in CUB ROOKIES, which almost sounds in-the-language but isn't ("Cubs rookie" is the commoner formation). The other theme entries don't even have the pretense of being in-the-language phrases. For example, CAPON DANCE, clued as [The Funky Chicken? ], is just silly. Then there's OSLO CHA-CHA, or [Steps in a Norwegian ballroom? ], the goofiest answer in the puzzle. Aww, too bad the rest of the theme couldn't be about dancing, too, or at least be assertively silly. The FAST REAMER drill just isn't silly. Least familiar word in the answers: ZOUAVE, or 89A: [French soldier from Algeria]. 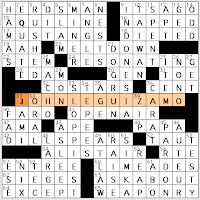 Patrick Jordan's themeless CrosSynergy "Sunday Challenge"
JOHN LEGUIZAMO stars in the middle of the grid. He is, among other things, a ["Carlito's Way" actor]. I like him. Something about his face reminds me of Gilbert Gottfried, only Leguizamo is a talented actor and not incessantly annoying. Hey, look! It's AQUILINE! I was just telling you about this word, clued as [Adjective for some noses]. Cowboy time! The HERDSMAN is a [Cattle drive figure], and the MUSTANGS are a [University Park, Texas team]. ["Permission has been granted"] clues "IT'S A GO." EDAM is clued as a [Spherical Dutch export]. Can I get a ruling from a geometrician? Balls of EDAM cheese are typically flattened and can't really be called spheres, can they? I'd like Britney Spears to have another kid as a single mom and name him DILL SPEARS ([Tart pickle wedges]). The Palestinian group HAMAS is a [Muslim Brotherhood offshoot]. Geographic trivia! INDONESIA is a [Nation with nearly 23,000 miles of coastline]. That's a whole lotta islands. [It experiences a hot flash] clues a FAD. What's more faddish than menopause, I ask you? [Carol Kane's "Taxi" role] is SIMKA. I started out with the Alaskan town SITKA. SIMKA was partnered with Andy Kaufman's nutty Latka Gravas. TESTY is clued as [Fractious]. I was always a little impressed with '80s stars Men at Work (of "Down Under" fame) because one of the non-hits on their hit album included the line "But he just smiled, said I was a fractious child." Yes, I owned the album. Vinyl!